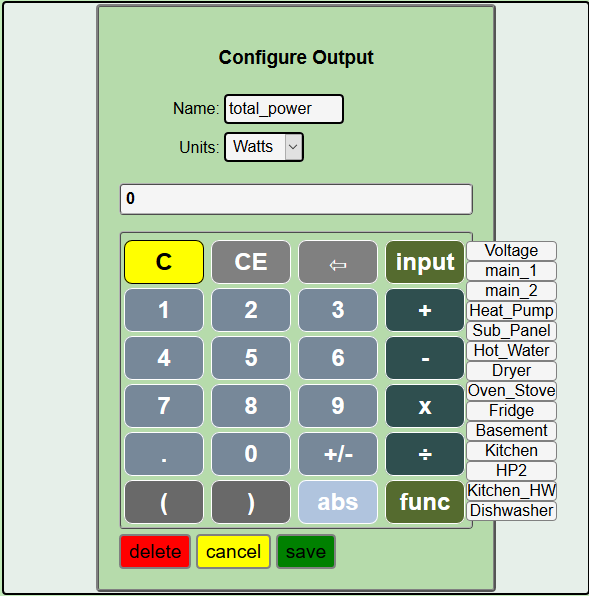 Outputs provide useful values that are computed from input channel values using a calculator like interface. For instance, in a typical US installation, there are two MAIN circuits, the sum of the two is the total power into a panel. 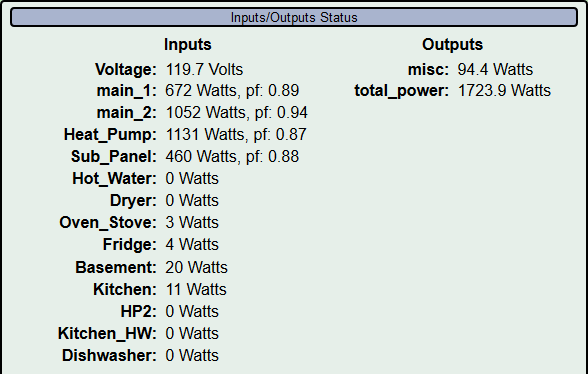 Its nice to know at a glance what that total is, but the two mains are measured separately using two input channels. We need a way to add them together to display the total usage. Hover over and click in the dropdown buttons. This screen will list any outputs that you have already configured, and allow you to click to create new ones. You can click on existing outputs to change or delete them. There is no practical limit to the number of outputs that you may create. The only requirement is that they be uniquely named. 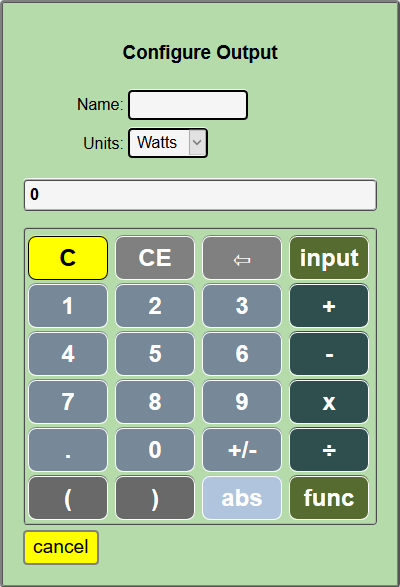 This is the calculator interface that IoTaWatt uses to specify how to calculate an output using input channel values. A script is created that IoTaWatt uses to compute the value when needed. It works just like the simple four function calculators we are all used to, and using the key, you can select input channel values to be used in the formula that you are creating. The resulting expression is evaluated left to right, with calculations within parenthesis evaluated before being used. So lets make an output channel that combines two main inputs called main_1 and main_2. 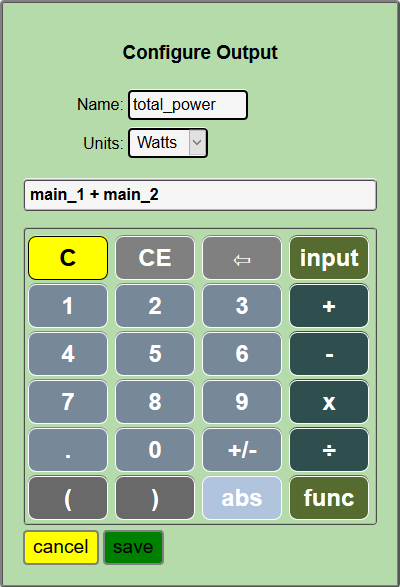 We enter the name total_power in the Name: box and hover over the button of the calculator to see a list of the inputs. Select main_1 from the list and it will appear in the calculator formula display. Next click on the , then repeat the input process selecting Main_2. Easy as that. Now press to return to the outputs list. Your new output should appear within a second or two. 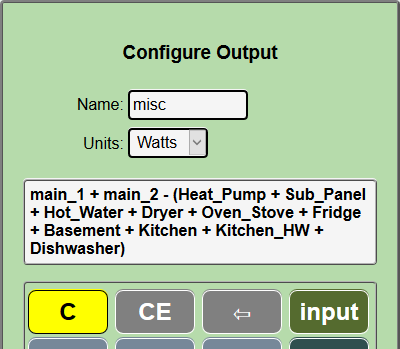 Now go back to the Channels Status screen and see that the new output channel is listed and indeed has a value that is the sum of the two inputs main_1 and main_2. Power used in a solar PV system, calculated by adding the Solar inverter input to the (signed) Main input. If for instance the inverter were putting out 4500 watts and your Main(s) indicated an outflow represented as -3100 watts, local usage would be 1400 watts with 3100 watts exported. © Copyright 2019, Bob Lemaire Revision bce96c87.